Beyond a reputable name and an established aircraft management process, what criteria differentiates one aircraft management company from another? Considering the scope of experience required to properly manage a multimillion dollar business jet, how does an aircraft owner or chief pilot evaluate and identify the best aircraft management company to support their aviation asset? To help answer these questions, Joe Barber, Director of Aircraft Management at Clay Lacy Aviation, shares three-touch points of what sets one aircraft management company apart from another. Who is the aircraft manager? The first component that sets a management company above the rest is the aircraft manager. “It’s simple really— what differentiates a manager. It is about how the manager treats people,” advises Joe. Not only must a manager understand the client and their specific needs, but also exhibit a harmonized approach to working with people. A cohesive management style is one that is built upon aircraft management experience. Additionally, a manager who displays an exceptional ability to listen and apply an owner’s desires and goals into actionable results is essential. The best aircraft managers treat everyone with respect, kindness and care. Owners and pilots can tell a lot about a company and the aircraft management side of the business by how an aircraft manager interacts with those inside— and outside— of his or her business network. What is the longevity and retention at the company? Owners and pilots are wise to question how long a company has operated, the longevity of the key employees within the organization, and the employees’ dedication to their role with the company. “In aircraft management, there will be times when situations go off-course, but the true test to whether a company is good or bad is recognizing how an individual recovers,” says Joe. “Are the employees dedicated to serving the customer for the long-term?” Longevity, retention and dedication are valuable indicators in regards to a successful aircraft management company. 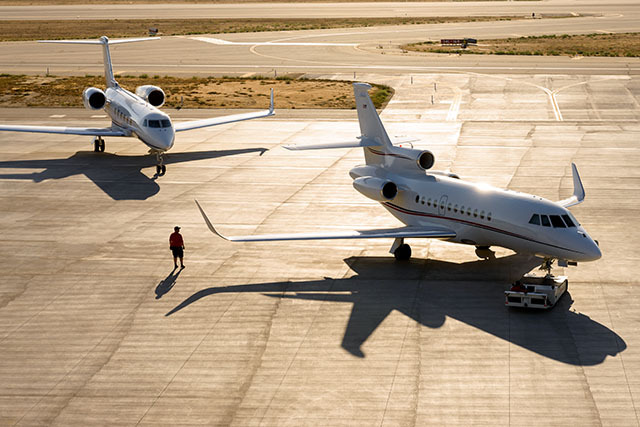 There is a definite advantage and convenience to managing an aircraft at Clay Lacy; as all aspects of jet ownership are available at one location. Aircraft managers work closely with— and personally know— the individuals who book charter flights, conduct aircraft maintenance and crew the jet. The team approach established, internally, creates trust and efficiency for jet owners. Managing a private jet takes a considerable amount of time and coordination. Owners often assume, in an effort to save on costs, that pilots can take on the role of both managing and flying, but a designated aircraft manager is truly a necessity when owning an aircraft. Pilots have enough responsibilities to be tasked with the additional job of managing a jet. “The nature of management requires daily touch-points. It’s not a decision an aircraft owner should take lightly,” says Joe. Interested in managing your jet with Clay Lacy? Contact an aircraft management professional today.